This is the fifth post in a series about my possible line of descent from Eleanor of Aquitaine. In the first post, I explained how I discovered the possible line, and how I am going to verify it one generation at a time. In the last post, I proved that my grandfather Johannes Marijnissen was the son of Cornelia Francisca van den Heuvel. Cornelia Francisca van den Heuvel represents a milestone in my possible line back to Eleanor. She’s the oldest generation for whom I have a photo, and also the oldest generation of whom I know personal stories since my mother knew her grandmother, who died in 1973. She died before I was born, so I never knew her or any of her ancestors. Even though she was born in 1893, not all of her records are public yet since she died less than fifty years ago. The birth was recorded the next day, with her father as the informant, making this record very reliable. The record was created in two-fold in the father’s presence, and he signed both copies. Two witnesses were required to sign the record, but they did not have to have personal knowledge of the birth; their role was to verify the creation of the record. One copy was kept at the municipality, and one was sent to the provincial capital for safekeeping. These record-keeping practices make these records very reliable. 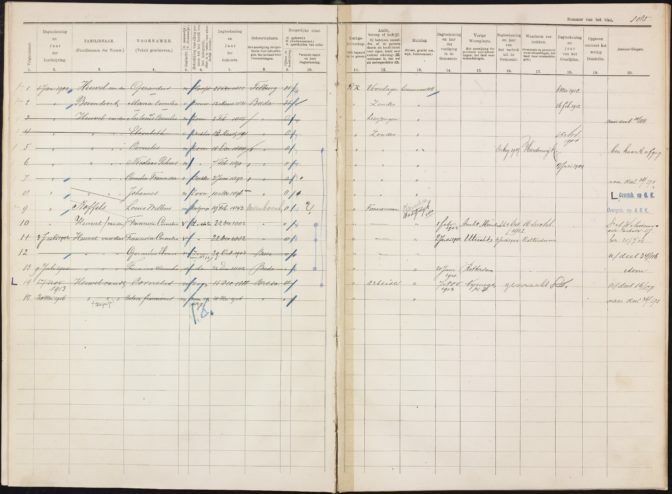 Population registers were created by civil servants based on vital events that were recorded by the civil registration and on information that people provided when they moved. If they came from another municipality, they would bring an extract of the information from their former place of residence. Every ten years, a census was held to verify and correct the population registers. Population registers can have copy errors, but these are usually limited to spellings and dates, not the family composition. 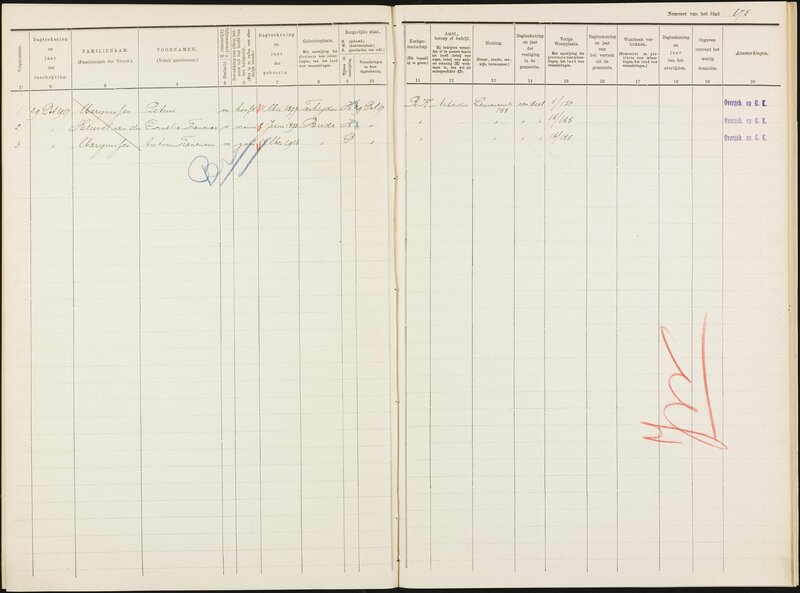 Cornelia Francisca van den Heuvel’s marriage record shows she married Petrus Marijnissen on 19 October 1917. It lists her age as 24, and her parents as Gerardus van den Heuvel, a 63-year-old butcher who lived in Breda, and Maria Cornelia Bovendeert, deceased. Her father Gerardus van den Heuvel was present at the marriage ceremony and gave his permission. 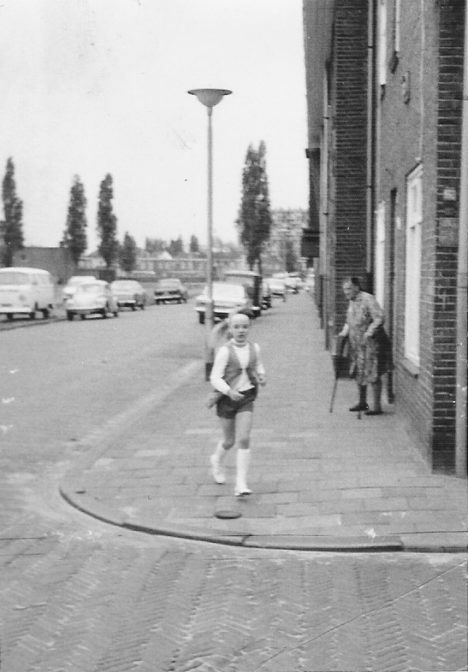 Witnesses were her brother Antonius van den Heuvel, a 32-year-old laborer, and Franciscus van Hulten, a 62-year-old municipal messenger.6 The latter witness was probably chosen as a convenience since he worked at town hall. Cornelia Francisca van den Heuvel, her brother Antonius, and her father Gerardus had first-hand knowledge about the identity of her parents. The marriage record was created and read aloud during the ceremony, affording them the opportunity to catch mistakes. There is pencilled note in the margin of the marriage record, “Leuvenaarstr. 158.” These kinds of notes were sometimes made by the civil servants when updating the population registers. It is the address of Cornelia Francisca van den Heuvel’s parents, and also the address where Petrus Marijnissen and Cornelia Francisca van den Heuvel started living after their marriage. When Corrnelia Francisca married Petrus Marijnissen, an extract of her birth certificate was submitted as proof of her identity and age. It is part of the marriage supplements.9 The extract is a derivative source with a chance of copy errors, but the information matches the original birth certificate. 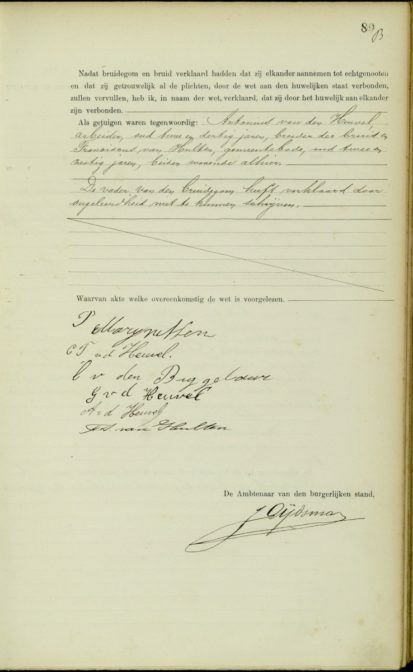 The fact that the extract of this birth certificate was submitted as part of the supplements for this marriage shows that the child mentioned in this birth certificate married Petrus Marijnissen. Because Cornelia died less than 50 years ago, her death record is not public yet. Although she was Catholic, no prayer card (“bidprentje”) was created to commemorate her death.10 A copy of her personal record card was obtained for personal use. The personal record card was created in 1938 as the successor of the population register. The initial details were copied from the population register and then verified with the civil registration birth record. It was kept up to date throughout her life, whenever she moved, and updated for the last time when she died. 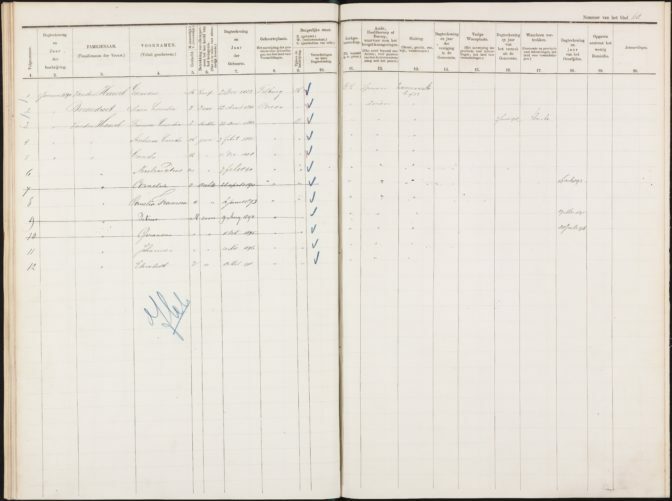 Afterward, the personal record card was processed by the Central Bureau for Statistics, and then sent to the Central Bureau for Genealogy, where copies can be ordered. Personal record cards are generally very reliable, especially the vital information about the person herself. The death date on the personal record card matches my mother’s recollections. It showed she lived in Breda all her life. The card shows that the daughter of Gerardus van den Heuvel and Maria Cornelia Bovendeert is the same person as the wife of Petrus Marijnissen and mother of Johannes Marijnissen. 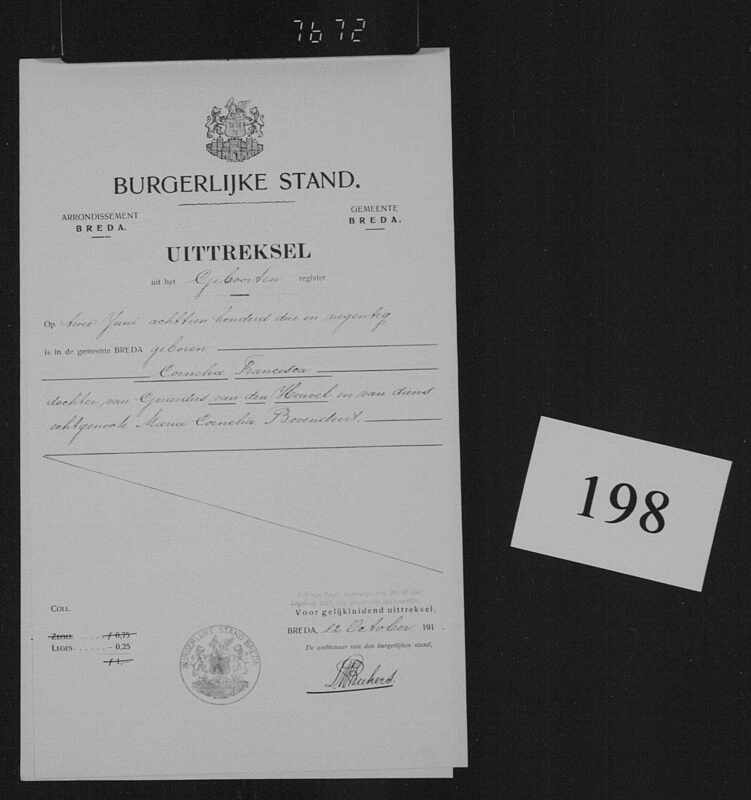 All the evidence is in agreement that Cornelia Francisca van den Heuvel was born in Breda on 2 June 1893 as the daughter of Gerardus van den Heuvel and Maria Cornelia Bovendeert. Most of the sources provide eye witness testimony about her parents. There are no conflicts, and the records match the recollections of my mother. Together, this proves that Cornelia Francisca van den Heuvel was the daughter of Gerardus van den Heuvel. Four generations down, 24 to go! “Nationaal Register Overledenen” [National Register Deceased], personal record card of Johannes Marijnissen, born Breda 11 November 1918 died Hengelo 7 January 1990; Centraal Bureau voor Genealogie; photocopy provided via mail. Also, Breda, Family cards 1918-1937, household of Petrus Marijnissen; “Genealogie,” index and images, Stadsarchief Breda (http://stadsarchief.breda.nl : accessed 7 May 2016). 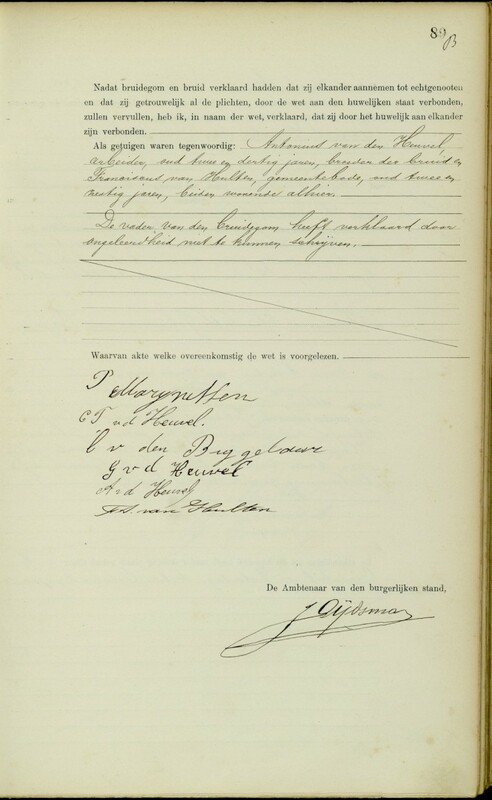 Civil Registration (Breda), birth record 1893 no. 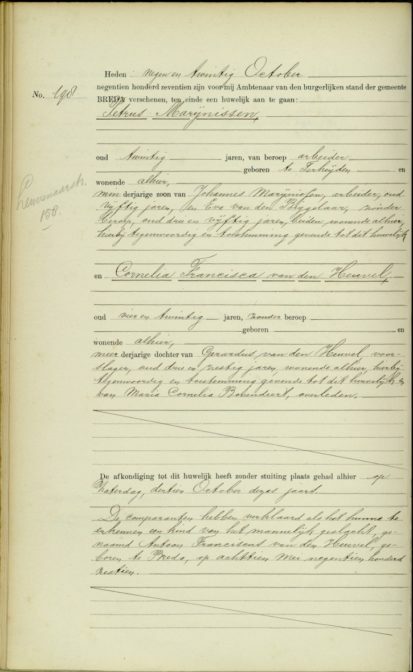 391, Cornelia Francisca van den Heuvel (3 juli 1893); “Genealogie,” index and images, Stadsarchief Breda (http://stadsarchief.breda.nl : accessed 7 May 2016). 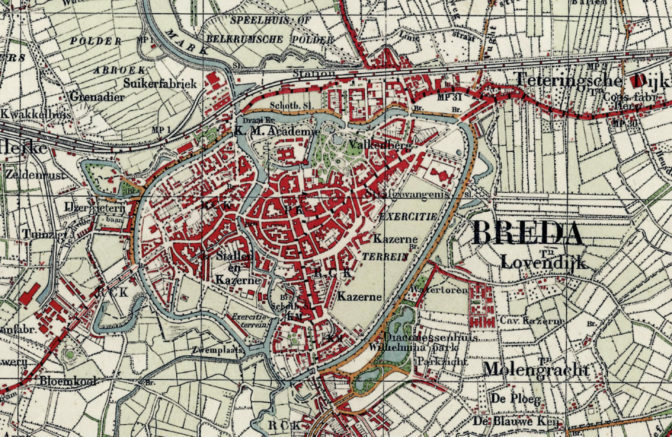 Breda, population register 1890-1900, vol. 17, p. 68, Gerardus van den Heuvel household; “Genealogie,” index and images, Stadsarchief Breda (http://stadsarchief.breda.nl : accessed 7 May 2016). Also, Breda, population register 1900-1920, vol. 16, p. 185, Gerardus van den Heuvel household. P.J. Wuisman and G.J. Rehm, “Concordans van de Wijknummering in the 19e eeuw en de tegenwoordige huisnummering” [Conversion of the ward numbering in the 19th century and the current house numbering], 1951; “Adresboeken, huis- en huisnummering,” digital images, Stadsarchief Breda (http://stadsarchief.breda.nl : accessed 22 December 2017) > WHN Breda Oud (pondboeken) 1800-1900. 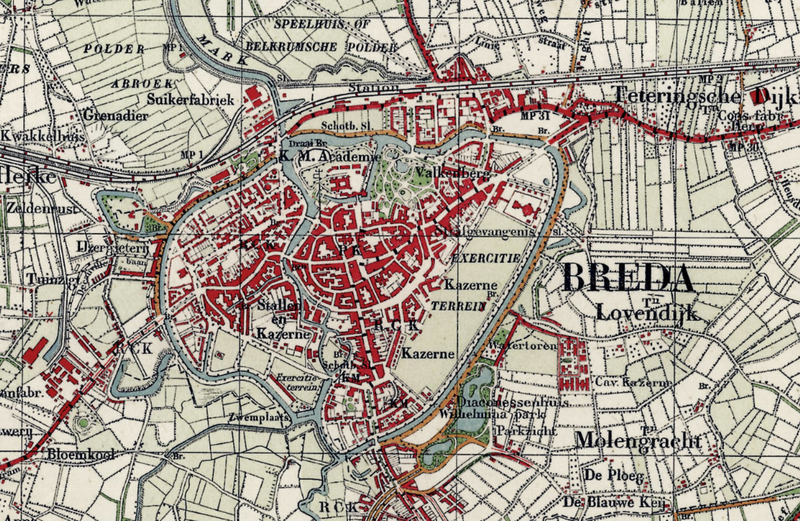 Breda, population register 1900-1920, vol. 35, p. 175, Petrus Marijnissen household. 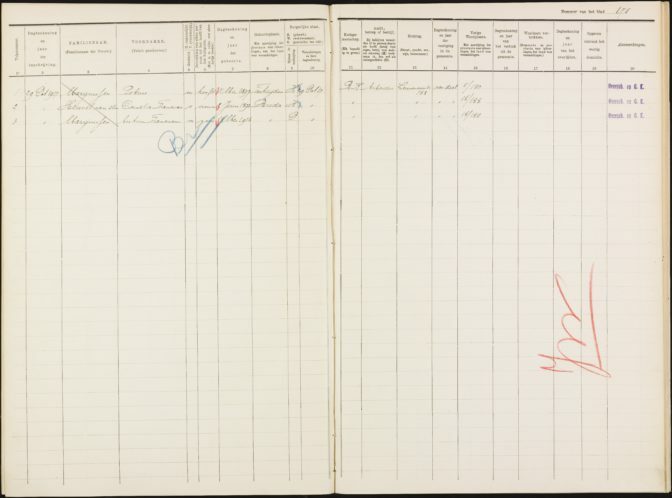 Civil Registration (Breda), marriage record 1917 no. 198, Marijnissen-Van den Heuvel (29 October 1917); “Genealogie,” index and images, Stadsarchief Breda (http://stadsarchief.breda.nl : accessed 7 May 2016). 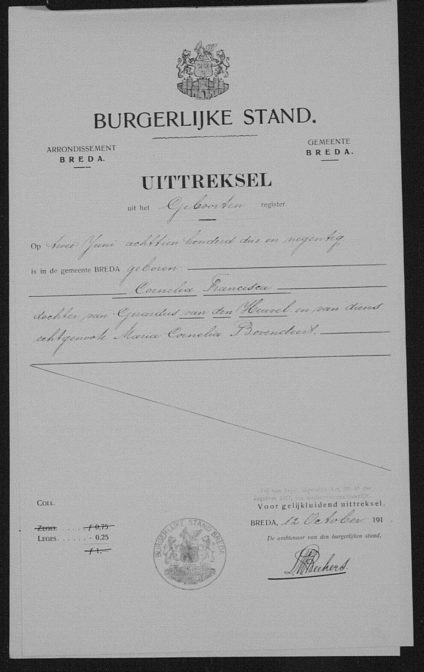 Civil Registration (Breda), birth record 1917 no. 701, Johannes Marijnissen (12 November 1918); Stadsarchief Breda, Breda. 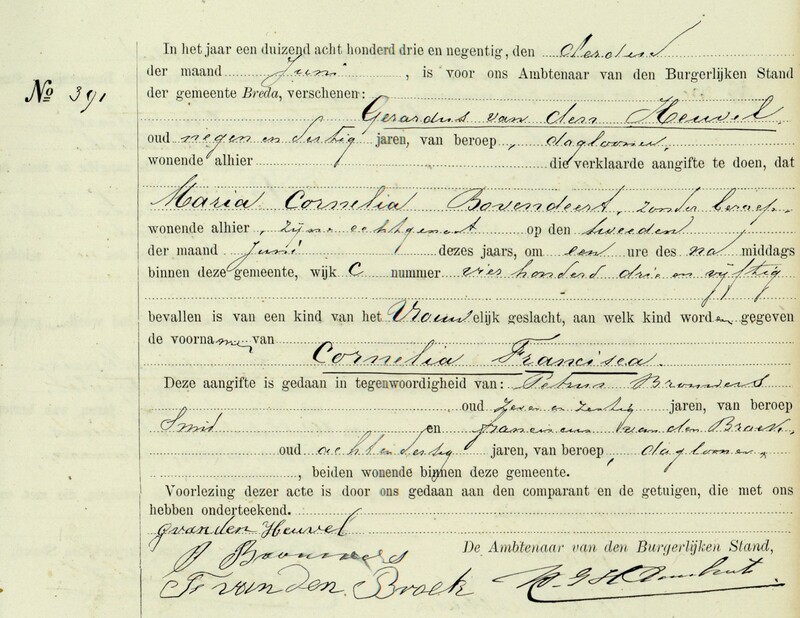 Civil Registration (Breda), birth record 1885 no. 74, Antonius Cornelis van den Heuvel (2 November 1885); “Genealogie,” index and images, Stadsarchief Breda (http://stadsarchief.breda.nl : accessed 17 February 2018). Civil Registration (Breda), marriage supplements 1917 no. 198, Van den Heuvel-Bovendeert (29 October 1917); digital film #004698347, browsable images, FamilySearch (http://familysearch.org : accessed 7 May 2016), image 1431-1434. No prayer card was found in the family records of Cornelia Francisca’s granddaughter Els Marijnissen, which does include a prayer card for Petrus Marijnissen and other family members. If there was a card, it should have been in her possession. Els recalls that her parents decided not to have a prayer card made. “Nationaal Register Overledenen” [National Register Deceased], personal record card of Cornelia Francisca van den Heuvel, born Breda 2 June 1893 died Breda 23 July 1973; Centraal Bureau voor Genealogie; photocopy provided via mail. Cadastral Municipality Breda, Series 1, Name list, entries for Marijnissen and Van den Heuvel; “Archiefviewer,” digital images, Kadaster (http://service10.kadaster.nl/iad/ : accessed 9 January 2018); available in reading room Nationaal Archief, The Hague. Cadastral Municipality Breda, “artikelregister” and “artikelsgewijze legger” no 5105; “Archiefviewer,” digital images, Kadaster (http://service10.kadaster.nl/iad/ : accessed 9 January 2018); available in reading room Nationaal Archief, The Hague. An address search for Amstelstraat 8 gave the current cadastral number with its predecessors, which was used to look up the owners. 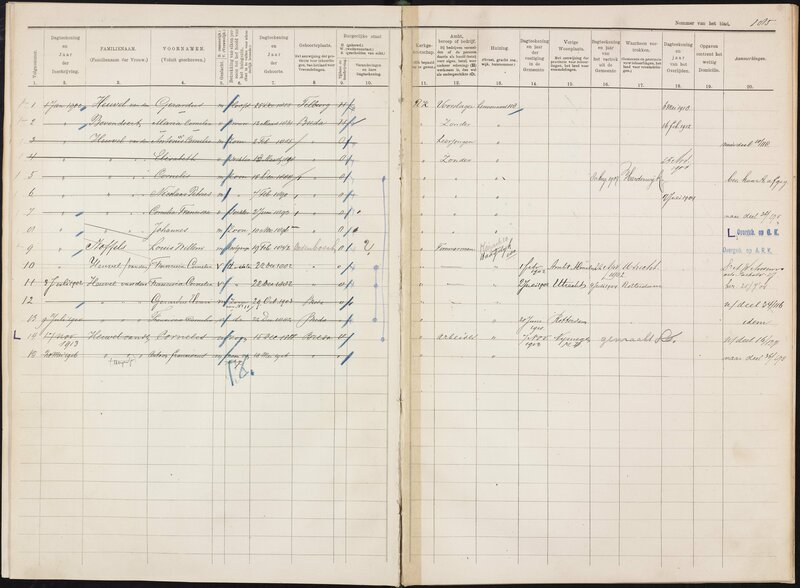 Central Last Wills register, entries for Van den Heuvel; microfiche, Central Bureau for Genealogy, The Hague. Cadastral Municipality Breda, Series 1, Name list, entries for Van den Heuvel; “Archiefviewer,” digital images, Kadaster (http://service10.kadaster.nl/iad/ : accessed 9 January 2018); available in reading room Nationaal Archief, The Hague. Also, Cadastral Municipality Tilburg, Series 1, Name list, entries for Van den Heuvel. An employee of the Brabant provincial archives searched the death duties files for Breda for 1918 and did not find a file for Gerardus van den Heuvel. Christian van der Ven, archivist at Brabants Historisch Informatiecentrum to Yvette Hoitink, email, “RE: Bestelling 423805,” 11 December 2017. Yvette, I love this series and the care you are taking to trace and prove each generation back to Eleanor of Aquaint. I have some questions about your great-grandmother: Was she disabled due to illness, or merely age? I see one photo of her on crutches. 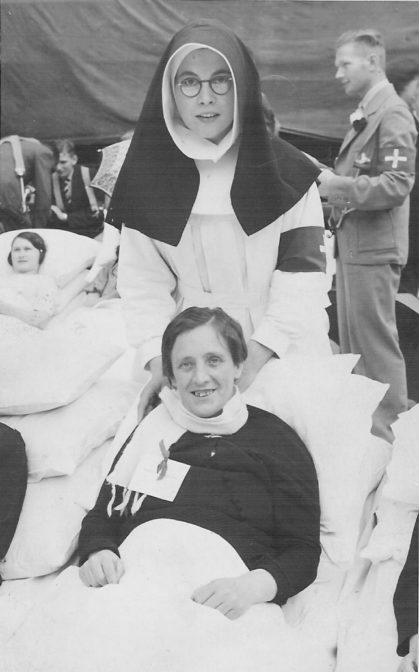 At first, I assumed she was the woman in the wheelchair in the first photo…but perhaps she is the Red Cross worker? She’s the woman in the bed/wheelchair; I clarified the caption. The woman behind her was a nun, so not my ancestor 🙂 Cornelia Francisca van den Heuvel had some kind of lung disease tht made her tired all the time. At one point, she wasn’t able to take care of her children so my uncle lived with his aunt for a while. Great that you’re enjoying the series! I love reading your blog! Especially, your work tracing your line back toward Eleanor of Aquitaine. What process do you go thru when information conflicts between different documents? I write research reports using different steps. First, I analyze what the document *says* (transcription or abstract). Then I analyze what it *means* (explanation of terms, understanding the underlying laws). Then I compare and contrast it to other records and note any points of overlap or conflict. Minor discrepancies such as name variations I resolve at that point if possible. When I’ve done that for all the records, I will look at the whole body of records to resolve the remaining conflicts. Conflicting evidence can be set aside if there’s an explanation, if it’s low quality (e.g. unreliable informant, derivative source with chance of copy errors), or if it’s the only piece of evidence that has the conflicting information. If I can resolve the conflicts and the body of evidence supports a conclusion, I write that out. I will be speaking about my process at the National Genealogical Society Family History Conference in Grand Rapids in May. Recordings will be available after the event. Thomas W. Jones’ book Mastering Genealogical Proof also explains how to resolve conflicts. I just published generation 5, in which I resolve a conflict in dates and a conflict in names. Cool! Have you verified all the links by doing original research? When I took a closer look at mine, several of the links were poorly documnted, which is why I’m writing the series. Following your process is very helpful. In this case, you comment that your great grandmother was poor, hence a lack of some information. Yet it seems to me that in spite of that, you are able to make some interesting conclusions. For instance, you couldn’t find a will, or anything that indicated that she or her husband owned property. Are these pieces of information part of your conclusion about her poverty? And do you think that the lack of a prayer card might be from the same cause–the family didn’t have the money to have one printed? Might it just have been lost? Since you don’t comment on the possible reason for that particular lack, is it because you don’t have data to support a conclusion? I knew from my mother’s stories that the family was poor. That fit with the photos (cheap haircut, bad teeth, cheap clothes), the lack of property ownership, lack of a will, and the part of town where they lived, which I know from stories and being in Breda was a poor area. It’s all consistent. My mother remembers that her parents chose not to have a prayer card made for her grandmother. They could have afforded one, but chose not to for personal reasons. I am behind in reading your blog posts, so just came across this series this morning. I’m enjoying reading – and learning from- your process of proving your connection. Thank you for the links which explain the Dutch records that are available and where we might be able to obtain a copy. Hopefully I can use the information to further the research on my Dutch line.